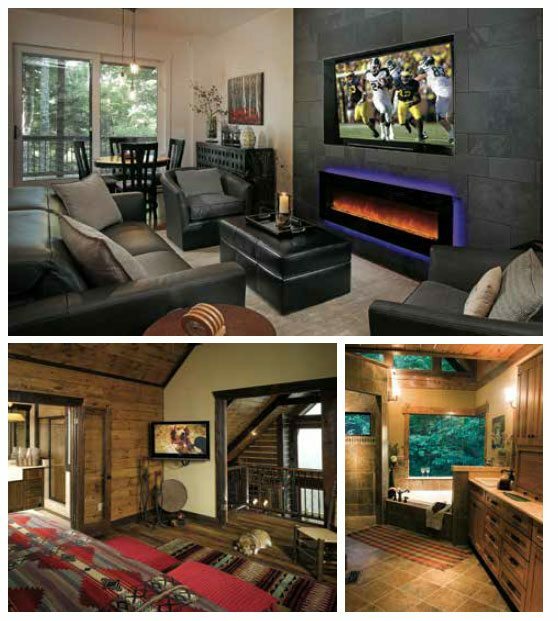 Rustic Mountain Homes have experienced a huge shift in design! Many think of a rustic mountain home as a log or timber frame home in the woods. That’s what Daniel Boone and our forefathers lived in! Their homes were simple, there were few “creature comforts” incorporated that our generation is addicted to. We love being in the woods, but there are some things, some “creature comforts” we can’t be without! We want our cappuccino in the morning which we get from our Italian coffee machine built into the wall. Our floors are heated with radiant heat systems so our feet stay warm. Our homes and outdoor areas are filled with music from our state of the art surround sound systems. Bathrooms include water closets with $10,000 toilets that do everything for you except…, well you have to do that! Kitchens have state of the art designs with appliances and features Martha Stewart would love. And our indoor and outdoor entertainment spaces run rival to a resort. Many homes have special dog rooms with a “dog wash” for Fido. Remember when we didn’t have TV’s, cell phones or microwaves? Was it really that long ago? Mountain homes have been popular for years as second or vacation homes. But the babyboomers are moving in droves to their mountain homes full time. With this shift, the rustic home has taken on a new personality. The really rustic details have been redefined, they are much cleaner, more refined, more “Modern Rustic.” The abundance of solid wood interior with brown and gray color schemes (wood’s inherent colors) has been diluted with a multitude of colors, addition of other materials like sheetrock, concrete and even steel. Solid wood walls, (the main character of a true log house) have been replaced with hybrid construction of traditional stud walls filled with foam insulation, covered with a multitude of finish materials. This allows for total flexibility of integration of electrical, plumbing, HVAC and other required systems that are hidden in our walls, floors and ceilings that support our creature comforts. Yes, technology is the huge driving force behind the design of the new rustic home. We are right in the middle of the “Technology Revolution” and upgrades happen at warp speed. Lighting a fire happens with the push of a button, not by rubbing together sticks or lighting a match. Hot water is instant, we don’t have to light a fire to boil water or wait for 10 minutes for the hot water to travel our pipes. The sound and image quality from our great room TV is coming close to a Dolby IMAX theater experience. We no longer have land lines in our houses – we are all permanently attached to our “communicator” I-Phones. And if you happen to really live deep in the woods where there is minimal cell service, don’t worry – there are “home cellular boosters” to fix that.